We had taken a trip out to the islands, went to Temple of Poseiden for sunset and spent over 10 hours walking the recommended tourist routes around the Acropolis and Athens local to that area. We had our last day open and planned to just take it easy around the hotel Athens Studios, 5 minutes from the Acropolis south entrance and the museum and a VERY super find !!. I do multiday biking tours in Asia my wife does not - so I saw this tour and saw it as an interesting outing for the two of us. I expected it to duplicate the places we'd walked on our earlier tours. Quite surprised. After a visit to Temple of Zeus and the Olympic stadium which we'd seen the tour went to places we had NOT been so we were rewarded with areas we would have otherwise missed. Also, Solebike tours provided earpiece receivers and a transmitter for the guide so always warned of the next turn and an impending curb or other risk and most important: continuous, thorough narration of the local attractions. On my longer trips on regular bikes in Asia, we only had narration when the tourguide decided to stop. This was much more of an informative and fun outing than we expected - - highly recommended. We booked this trip to get an overview over Athens attractions, and we really did :- We got good guiding, and we felt safe cycling with our nice and informative young guide. He could have had better knowledge of myths, history and politics, but we really enjoyed our time with the guide anyhow. Fantastic experience. Owner and tour guide shout out to Angelos were very nice and very understanding and interesting. We went for our honeymoon and they were so nice to give us a little gift as well. The bikes are great to use and I encourage this tour for anyone interested in seeing Athens in a fun way. 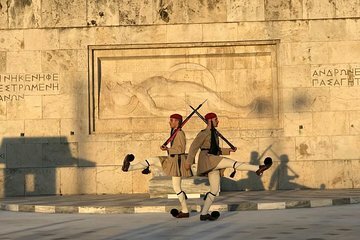 Athens is a city rich in historical and personality, she is full of hidden treasures and secret waiting to be revealed, and our guide Costas have exceeded all of our expectation, he is friendly, informative, personal, helpful and best of all he love his city and passionate in helping us discover her mystical qualities. We had a great time, Thank you Costas and Sofia for our wonderful memories..
Angelo was onze gids. Hij loodste ons op deskundige wijze door Athene. Hij liet ons de mooiste plekjes zien en gaf daarbij veel toelichting..